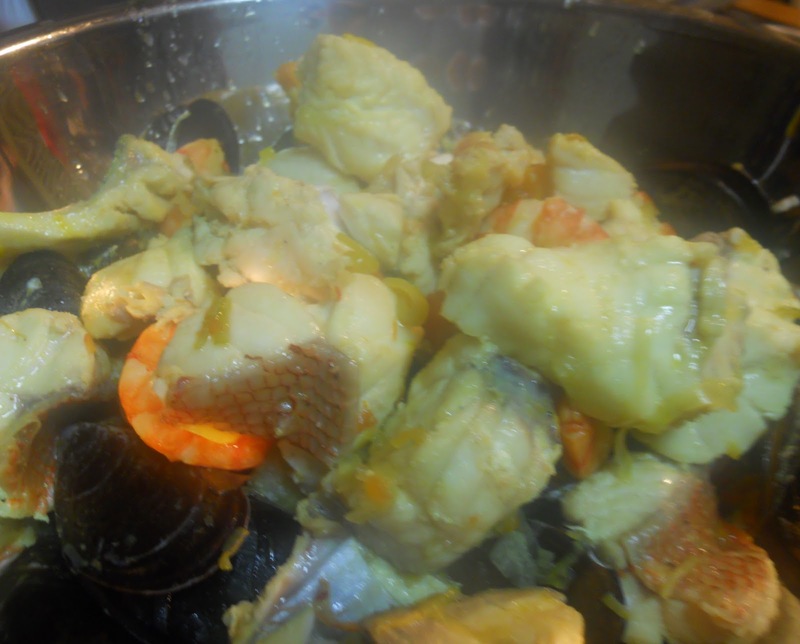 The whole day was busy with this 'fish soup' (forgive me for saying these two words, I don't mean to hurt your feelings). And I didn't even wake up early enough to join our chef shopping. 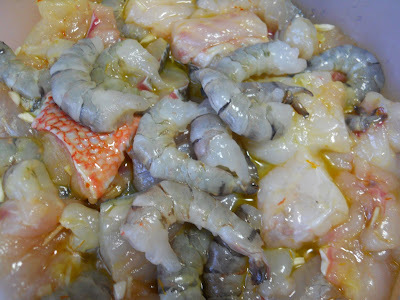 If I put it into bouillabaisse recipe format it is going to look long and scary. Better I'll just tell you about the day. 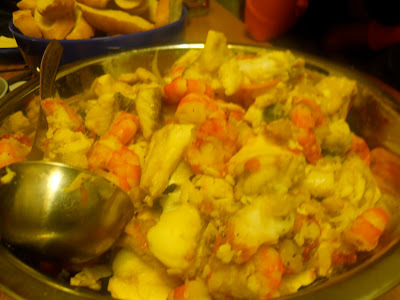 Misha's bouillabaisse is inspired by Le Miramar port restaurant in Marseille. 'It is getting more and more expensive to have bouillabaisse in Marseille' he sais, 'last time the two of us paid something like 350 euros in Le Miramar'. Those who do not sleep as much as I do went to La Maree in the morning to get the fish. It seems to be a root source of all the fresh fish in Moscow - a wholesale outlet that sells fish to restaurant chefs and Dorogomilovsky market fish traders. You get their price list, call them the day before and make your order. 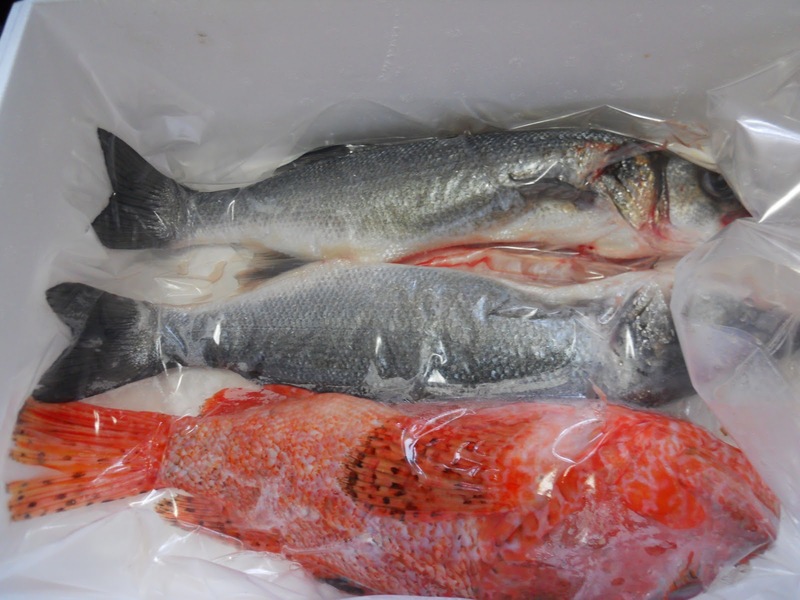 'We even saw how they transform frozen fish into fresh fish' Misha sais - 'it is unfreezing in huge baths. 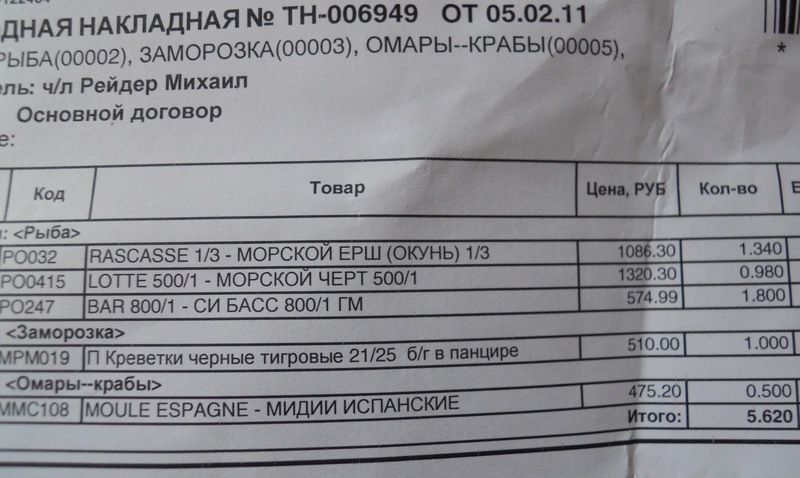 No real fresh fish is available in Moscow'. The rest of vegetables, spices and baguettes they got in the market and at Azbuka vkusa (one of the upscale food supermarket chains in Moscow). Just look at these little babies. Misha says, if you do it properly, there should be 6 kinds of fish. We have 3 only (leaving alone shrimps and mussels), however 3 most important ones. Sea bass, Rascasse or scorpionfish. Really pretty, no? 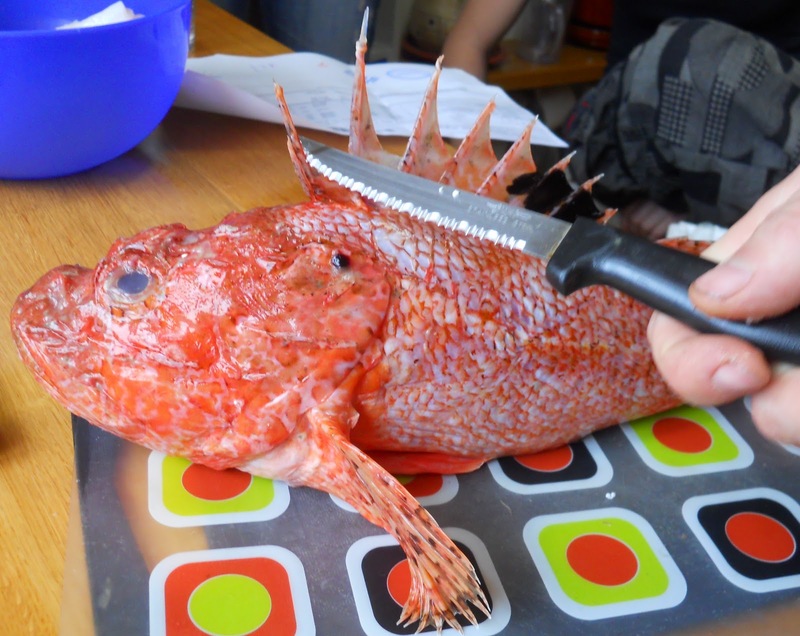 Angler or frog fish or sea devil's tail. It tastes better than it looks. Really. 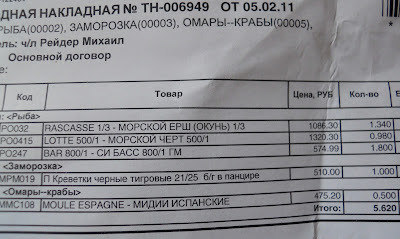 Apparently at La Maree Misha got the fish cheaper than I did on Dorogomilovsky market. 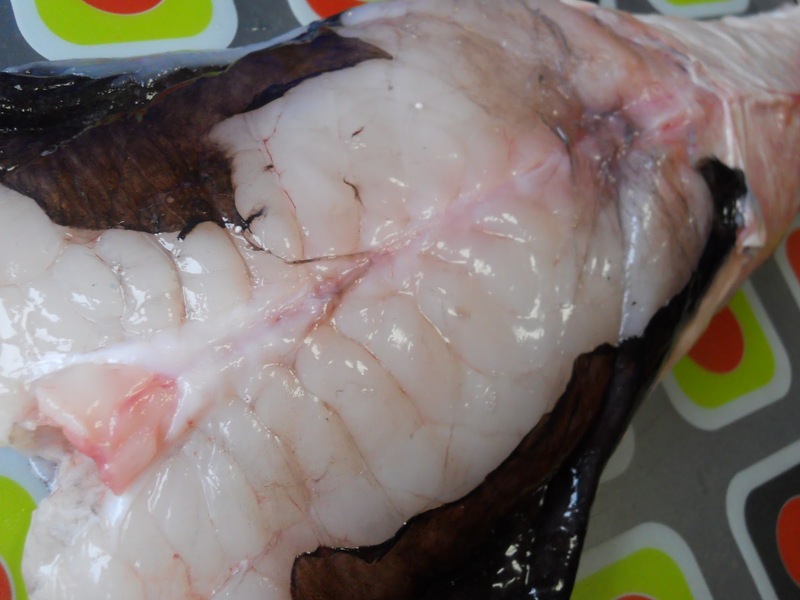 However there you probably don't have the leisure of getting it filleted. So Misha cuts the fish off the bones and gets rid of sea devil's black film. He browns sliced onions in butter. Katia is making bouquet garni. 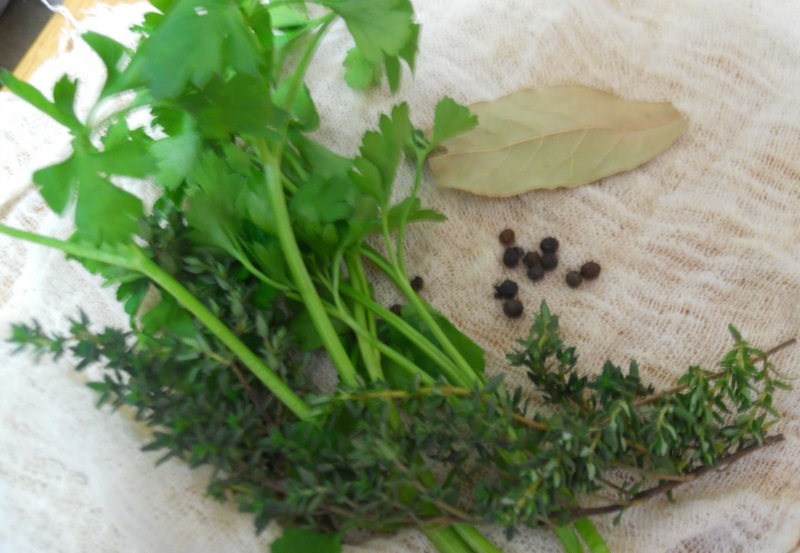 For those like me who do not remember by heart, the bouquet consists of a bay leaf, fresh parsley and thyme. We also put black peppercorns into the same piece of cheesecloth and tie it up. Into a huge pan go the onions, fish bones and heads, cold water and bouquet garni. Now we have to leave it simmering for 2 hours. And to take the foam off it from time to time. Yes, 2 hours. Misha is really serious about it. 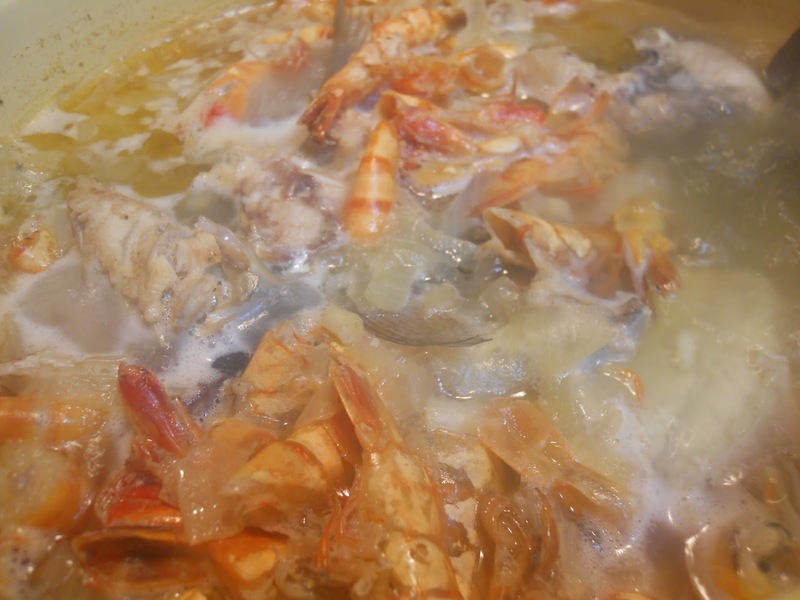 If you do this, all the pieces of fish completely disintegrate into the broth. It gets really thick and flavorful. I can confirm now. I really does. You have to take the bouquet garni out some short time after the start though. Then we filter the magic liquid and set it aside. Looks like something firm. I wish you could smell it. While the broth was cooking, we marinated the fish. The fish got cut into large pieces, put together with peeled shrimps, 1/4 cup of olive oil, some 4 crushed cloves of garlic and pinch of saffron threads (soaked in warm white wine beforehand) and set in the fridge. Finely chopped onions, leak and 2 celery sticks go into the hot olive oil. Then in go peeled, seeded and chopped tomatoes. Misha adds white wine (originally, should be Cassis), the broth, another pinch of saffron soaked in wine, freshly ground black pepper, salt and another bouquet garni (don't forget to take it out some small time after...). Another half an hour of simmering. In goes the marinated fish. As soon as it is cooked (must be something under 5 minutes) the fish goes out into a serving dish. I really want a piece, but I'm not going to take any. Misha is not going to allow this and I'm afraid of him getting angry. The soup gets through the sieve once again. Then the broth goes back to the pan. The chef keeps adding stuff: tomato paste and orange peel and easily could be something else I missed. I'm slowly going off already. While these infinite iterations keep happening with the bouillabaisse, we are making the croutons. Slicing the baguette and drying it in the oven. Now the Rouille sause. We remove the crust from a large baguette and soak the crumbs in the broth. In the blender bowl goes 1 egg yolk, the crumbs, 4 crushed cloves of garlic, red and black pepper, salt and a pinch of saffron threads soaked in white wine. We switch on the blender. When the mixture goes smooth, we start slowly pouring a glass of olive oil in. The oil gets absorbed and forms a smooth sauce. Misha explains roughly the following. 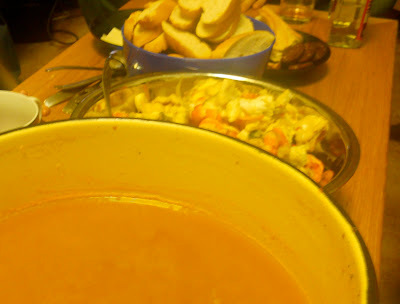 For the first go you get a bowl filled with bouillabaisse broth only. You rub a crouton with a clove of garlic and spread some rouille over it. 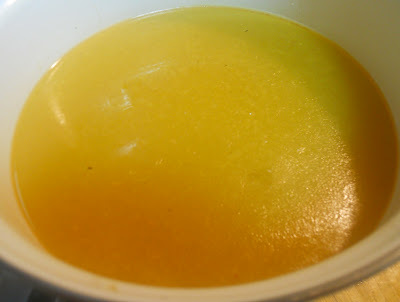 Put the crouton into the soup and have it with the broth. The soup tastes very strongly. Thick and oily, doesn't resemble any other one. Second go, when you are not too hungry any more, put some fish into your bowl, add some more soup and enjoy. Oh, almost forgot. Goes really well with rose wine. We are lucky, Misha got a bottle of Bandol. Long post to the long day. 21:00 so good to start eating at last. I'm sure I confused some of the cooking details, so Misha's comments will probably appear soon and clear everything.